... an old german kids game. The rules are easy. You say what you put in your holiday bag. Than your friend says, what he puts in the bag. But he also has to repeat, what you've already put in. And so on. Until one can't remember anymore what's already in the bag. Germaid is going to be on a big tour through Europe from May to October 2013 with her bright red VW bus called „Bobby“. This is the principle of „I pack my bags and take with me...“: Germaid is going to start the tour with a bunch of her originals and German folksongs, as well as Country & Americana material in English. In every country she's travelling to, she's going to learn new songs in the particular language or even in different dialects. She is going to add all these songs to her program and will be taking them to the next country, in which she's going to learn and perform further new songs in another language. 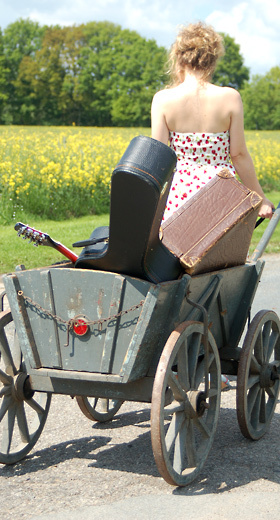 This is how Germaid carries different culture across Europe - only with her voice and her guitar. In that way Germaid makes it possible to hear a Finnish folk song, with a German dialect, about the long winter in Lapland while joining a HOUSE CONCERT in sunny Bilbao in the North of Spain. In the end of her tour, there will be a varied program full of new songs and stories out of different countries of Europe - and for sure in a large variety of languages.